The team from Belleek Castle celebrate after receiving the award for the Best Customer Service in Connacht at the Irish Restaurant Awards. Belleek Castle is an iconic Irish Country House, Restaurant and spectacular wedding venue. The general manager Maya Nikolaeva and her team are thrilled to announce their recent awards. This week the Library Restaurant at Belleek Castle has picked up the award for Best Restaurant in Connacht at the Good Eating Guide Awards. Local chef Stephen Lenahan leads the kitchen team and his philosophy to use local and seasonal ingredients has proved successful and together with his talented team has won a large range of awards for their food over the last couple of years. The Library Restaurant was also very proud to win the Best Customer Service in Mayo award at the Restaurant Association of Ireland awards two weeks ago. 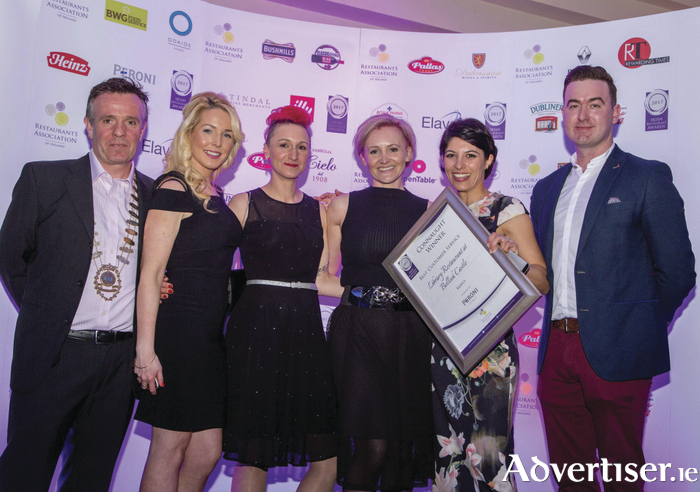 The restaurant has previously won best restaurant in Mayo for 2014, 2015 and 2016. Belleek Castle also represented Mayo at the national awards where they won the Best Hotel Restaurant in Connacht in 2014 and 2016. Maya and her team are looking forward to the national awards again in May.